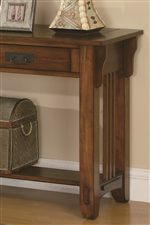 Outfit your living and entertaining space with this charming end table. Crafted with a warm brown oak finish, it adds a livening touch with its presence. The sides feature slat accents for a subtle mission styling, and there is both a drawer and a shelf for storage. Stunning butterfly knot inlays on the table top add a finishing touch. The Occasional Group Drawer End Table with Shelf by Coaster at Furniture Discount Warehouse TM in the Crystal Lake, Cary, Algonquin area. Product availability may vary. Contact us for the most current availability on this product.